Cristina Zenato was born in Italy and grew up in the middle of the rain forest of the African Congo until the age of 15. She is fluent in five languages and is a diving operation manager and active full cave and technical diving instructor and committed conservationist. Cristina fell in love with diving in 1994 during a vacation to the Bahamas and decided to make the Bahamas her home and diving her life. 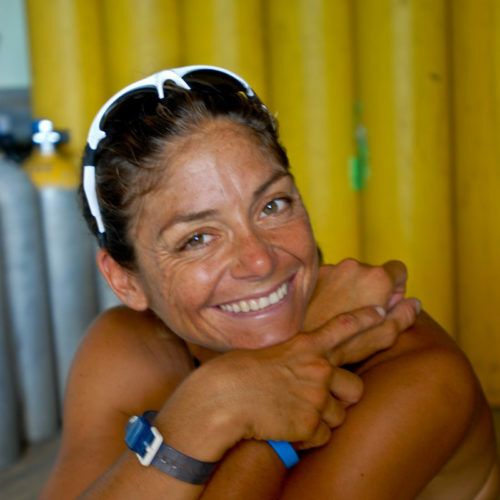 She has maintained this original passion for diving and actively teaches and guides daily. 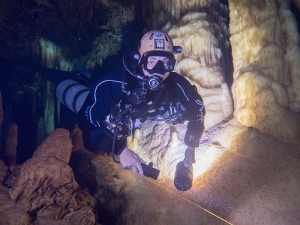 She certified as a full cave diver in 1996 and became a full cave diving and technical instructor in 2000. Cristina’s love for diving and cave exploration is only rivaled by her commitment to conservation. Cristina is known for her work with sharks and she has the unique gift of being able to put them into a state of hypnosis. Sharks respond comfortably to her touch and approach. She uses this technique to remove hooks, parasites and to educate people on viewing sharks differently. She has assisted scientists’ non-intrusive work on sharks in the wild and the collection of DNA data. Cristina’s non-profit work with shark conservation has appeared in National Geographic, BBC Science, Pianeta Mare, Ushuaia and diving magazines around the world in more then 20 different languages. Cristina has dived all the available and lined caves on Grand Bahama, and has accumulated experience in the caves of Florida, Bahamas and Mexico. Cristina has volunteered to map one major cave system on Grand Bahama. She has actively explored dozens of cave entrances over the island and has recently connected an Ocean Blue Hole with a land cave. This survey project and Cristina’s active cave diving instruction has brought her close to environmental issues on these fragile islands. Cristina actively works on the proposal of creating MPA, organizes, controls and maintains a diving mooring system on the South Shore of Grand Bahama to prevent anchor on the reef. Cristina volunteers her time for local school education, free Bahamian scuba training and is a Women Divers Hall of fame training program and Rolex Our World Underwater Scholarship Society sponsor. She is a Platinum Pro 5000 award recipient and a recognized member of the Women Divers Hall of Fame, The Explorers Club and Ocean Artists Society.